Whether businesses are moving to the cloud to speed up innovation, discover important insights from their data, or transform the way they work, they often need help. That's where our thousands of Google Cloud partners come in, offering everything from migration support and solutions built on our platform to value-added services. They’re an indispensable part of our mission to bring the cloud to more businesses. As we approach our third annual Next conference, we’ve seen amazing progress in our partner ecosystem. Since the start of 2017, we’ve increased the number of technology partners by 10x and we’ve more than doubled our team supporting these partners. Channel partners are also an integral part of our go-to-market strategy, and we’re delighted with the joint success we’re achieving. In the last year we’ve signed new and expanded partnerships with Accenture, Deloitte, KPMG and many, many more. These partnerships are already having a positive impact on our customers, who can use Google Cloud through their existing partner relationships and generally get the benefits of cloud more easily. 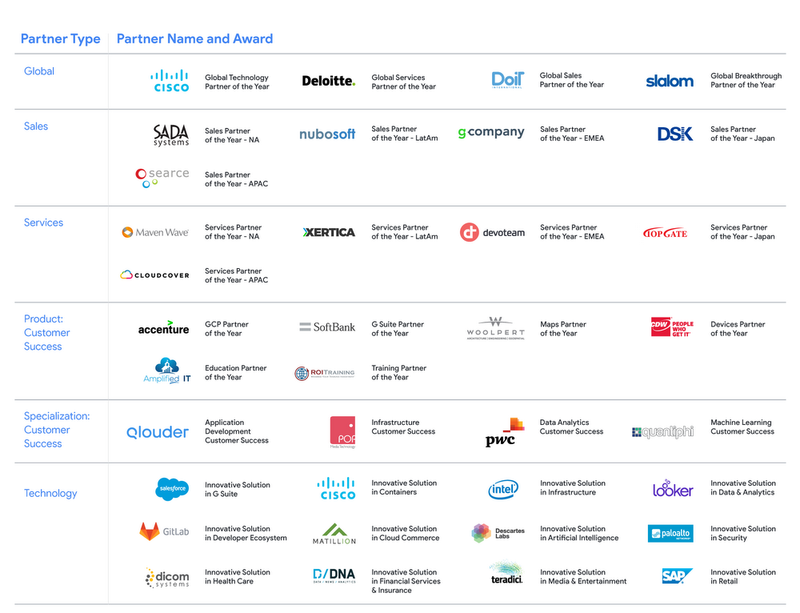 A co-selling program that matches GCP sales experts with our SaaS partners to help deliver GCP-run SaaS solutions to customers. A new program that connects Google’s Customer Reliability Engineering (CRE) team with our SaaS partners to keep their products up and running on Google Cloud. A new way for partners to receive Marketing Development Funds (MDFs) from Google based on how much use of GCP they drive with their SaaS products. A robust online community for SaaS partners to network with each other, receive updates from Google Cloud, and share best practices with other SaaS community members. We’re already working with top SaaS partners like Salesforce, Box, MongoDB, Zenoss, Elastic, RedisLabs, JFrog, BetterCloud, DialPad, and many more—learn more about our new SaaS initiative. New SAP solutions. We’re collaborating with Deloitte to help SAP customers extend their cloud strategies into more use cases. Deloitte will offer a full suite of solutions for running SAP applications on GCP, including the Deloitte Invoice Management Solution, which automates invoice processing in the SAP system landscape, and the Deloitte Visual Inspection Solution, which automates the visual inspection process and accelerates tasks like inventory restocking. Find out more about this Deloitte partnership. Updates to our work with Cisco. We’ll be announcing further updates to our partnership with Cisco during the course of Next ‘18, including exciting news in the collaboration and AI spaces, as well as a new developer challenge in partnership with Cisco to drive innovation on hybrid solutions across the Cisco Container Platform and GCP. Stay tuned for more on these initiatives. New DLT solutions. Customers can now explore ways they might use distributed ledger technology (DLT) frameworks on GCP with launch partners including Digital Asset and BlockApps, and try open-source integrations for Hyperledger Fabric and Ethereum later this year in our GCP Marketplace. Learn more at Next ’18 at our DLT Partnerships session. New resource for high-performance cloud help. In collaboration with Intel and Appsbroker, we’re rolling out a new center of excellence that offers resources, tips and best practices to help customers migrate all kinds of high-performance cloud computing workloads onto GCP, using tailored, customer-specific guidance. You can meet the team behind the Extreme Cloud Center of Excellence at the Intel booth at Next ’18 in San Francisco, or learn more here. New NetApp Cloud Volumes for GCP. One challenge that companies face in moving workloads to the cloud is access to high-performance, scalable, and shared file-systems that many applications need. Last week, NetApp announced new capabilities designed to help customers access these systems, including a new SMB protocol service to enable Windows and UNIX-based applications to be built and deployed on GCP, and expanded availability of NetApp Cloud Volumes for GCP, so the service will be available to even more customers. New VMware plug-in. We’ve announced a new plug-in for VMware vRealize Orchestrator so that customers can use GCP alongside their on-premise VMware environment. This new plug-in lets users create vRealize Automation blueprints, which allow for end-user self-service catalogs, initiating Day 2 operations on Compute Engine VMs, reclaiming provisioned resources and more. And it lets customers keep their existing governance and approval processes, making consumption of cloud resources more secure and trackable. You can read more on the GCP blog. Many customers need partners with a great deal of experience in a particular area to help them build advanced solutions for their businesses. To help customers identify the right partner, we offer Specializations, a designation that recognizes partners with deep technical expertise and proven customer success in a particular area. Now, we’ve designated 19 new partners in five new specialization areas, expanding our program to nine total specializations. Partners who have earned a Specialization have multiple individuals on staff with the highest level of certification, demonstrated and documented customer success stories, and have passed a rigorous capability assessment from experts on our Professional Services team. Find out more about the Specialization program. Our 2017 Partner Awards recognize partners who really dedicated themselves to creating industry-leading solutions and strong customer experiences with Google Cloud. Join us in congratulating the winners! We can’t think of a better way to kick off Next ‘18 than celebrating the partners that help so many of our customers transform their businesses. We look forward to welcoming many new partners into our network in 2018, and we can’t wait to see what new ideas and solutions emerge this year. To learn more about our program, find a partner, or become one, visit our partner page.